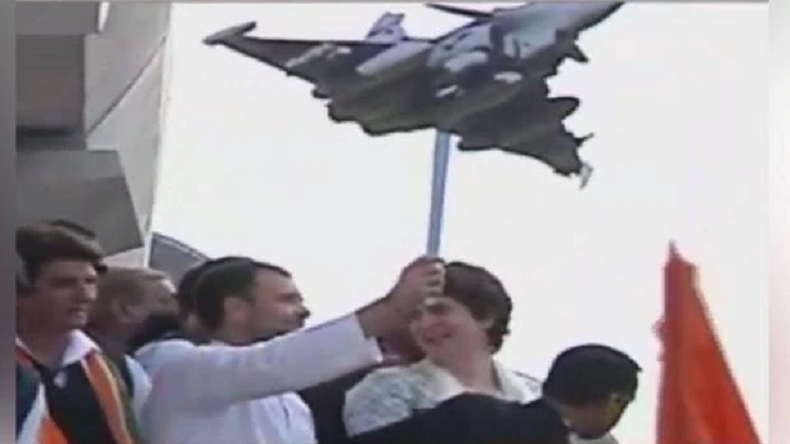 During the roadshow in Lucknow today, Congress chief Rahul Gandhi and East UP general secretary Priyanka Gandhi attacked the Prime Minister Narendra Modi-led NDA government with an effigy of Rafale fighter jet in their hand. Priyanka Gandhi was accompanied by UP president Raj Babbar, West UP general secretary Jyotiraditya Scindia and other top leaders. Ahead of Lok Sabha elections 2019, all parties have geared up for the intense contest, which is likely to be held after a few months from now. Today, East Uttar Pradesh Congress general secretary Priyanka Gandhi did a roadshow in the state capital Lucknow and tried to woo the people of the state. Priyanka Gandhi was accompanied by her brother and Congress chief Rahul Gandhi, UP president Raj Babbar, newly appointed West UP general secretary Jyotiraditya Scindia and other top leaders. It was extravaganza show by the Congress leaders as thousands of party workers and Rahul Gandhi, Priyanka Gandhi followers were on the street to attend the roadshow. In the rally, Congress leaders once again attacked the PM Narendra Modi-led NDA government over the alleged Rafale scam. But this time Congress chief did something different, Rahul Gandhi and Priyanka Gandhi were holding an effigy of the Rafale fighter jet and lashed out without saying a word this time. What is the Rafale deal controversy? The Narendra Modi government in April 2015 had announced to buy 36 Rafale fighter jets from France’s Dassault Aviation. The Rafale was stamped by the erstwhile UPA government in 2012 over other options from the USA, Russia and Europe. The Manmohan Singh government had proposed to buy 126 fighter jets. Turning the plan, Narendra Modi government said that India would buy only 36 fighter jets. The Defence Ministry had said that the step was needed to upgrade India’s ageing fleet. Rolling back the decision, the Modi government reportedly said that buying 126 twin-engined planes would be too expensive and the deal fell through after nearly decade-long negotiations between India and France. The controversy erupted over the transparency in the multi-billion dollar deal and the Congress called it one of the biggest scam and failure of the Narendra Modi government and the Make-in-India programme. Is National Thowheeth Jama'ath linked to Sri Lanka bomb blasts?